Actionable notifications let the user respond to a notification directly from the notification interface. In addition to the notification's content, an actionable notification displays one or more buttons representing the actions that the user can take. Tapping one of the buttons forwards the selected action to your app, without bringing the app to the foreground. If your app supports actionable notification types, you must handle the associated actions. You declare actionable notification types at launch time at the same time you declare your app's supported categories. For more information, see Declaring Your Actionable Notification Types. You handle selected actions from the delegate object of the shared UNUserNotificationCenter object. When the user selects an action, the system launches your app in the background and calls the delegate’s userNotificationCenter(_:didReceive:withCompletionHandler:) method. Match the value in the actionIdentifier property of the response object to one of your app's actions. Be prepared for the action identifier to match one of the system-defined actions as well. The system reports special actions when the user dismisses the notification or launches your app. Listing 1 shows an example that processes actions associated with a meeting invitation. 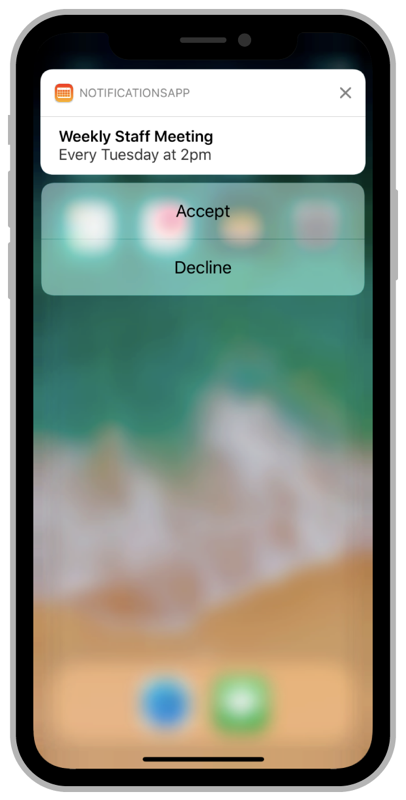 The ACCEPT_ACTION and DECLINE_ACTION strings identify the app-specific actions, which generate an appropriate response to the meeting invitation. If the user doesn't choose one of the app-defined actions, the method saves the invitation until the user launches the app. // Retrieve the meeting details. //  if the user does not act. If a notification arrives when your app is running in the foreground, the system delivers that notification directly to your app. Upon receiving a notification, you can use the notification's payload to do whatever you want. For example, you can update your app's interface to reflect new information contained in the notification. You can then suppress any scheduled alerts or modify those alerts. When a notification arrives, the system calls the userNotificationCenter(_:willPresent:withCompletionHandler:) method of the UNUserNotificationCenter object’s delegate. Use that method to process the notification and let the system know how you want it to proceed. Listing 2 shows a version of this method for a calendar app. When a meeting invitation arrives, the app calls its custom queueMeetingForDelivery method to show the new invitation in the app’s interface. The app also asks the system to play the notification’s sound by passing the sound value to the completion handler. For other notification types, the method silences the notification. // Add the meeting to the queue. // Play a sound to let the user know about the invitation. // Don't alert the user for other types. If you registered your app with PushKit, notifications targeting PushKit-types are always delivered directly to your app and are never displayed to the user. If your app is in the foreground or background, the system gives your app time to process the notification. If your app is not running, the system launches your app in the background so that it can process the notification. To send a PushKit notification, your provider server must set the notification's topic to the appropriate target, such as your app's complication. For more information about registering for PushKit notifications, see PushKit.